MONSTER TRUCKS!! FREESTYLE MX!! MUD BOGS!! TRACTOR PULLS!! Committed to bringing you and your family a fun, exciting, and memorable show that will have you on the edge of your seat! 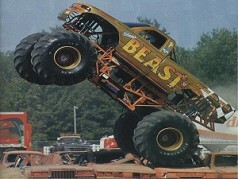 We can bring you any type of motor sports available with Monster Trucks being the main attraction.